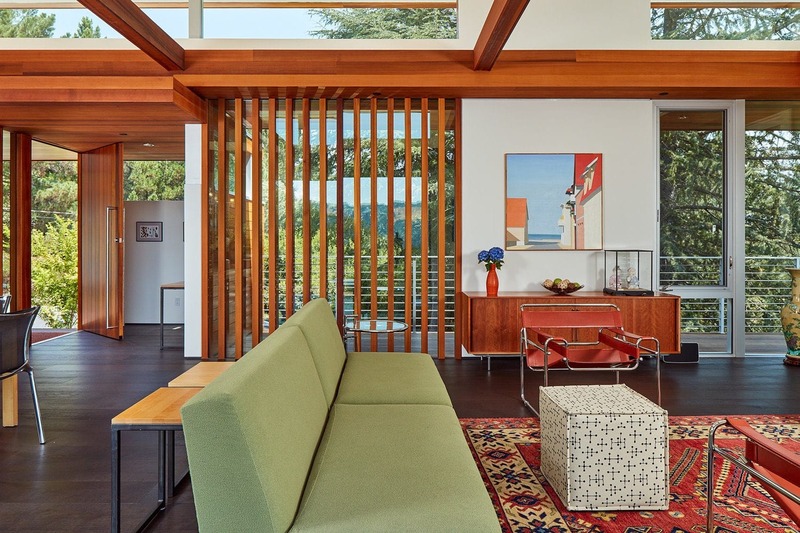 Designed in 2013, the Cheng-Reinganum Residence was brought to completion in 2016 by Swatt | Miers architects for a family with children in search of a home to reflect their new lifestyle. 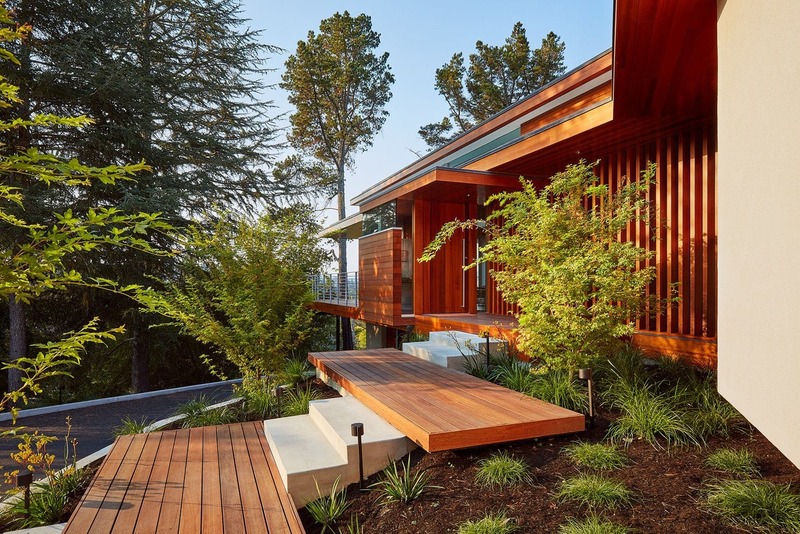 Resting at the top of the beautiful Californian hillside, lush with sycamore, pine and oak trees, the modern house architecture boasts an incredible view of the rolling hills together with the sight of Mount Diablo beyond the bounds. What really strikes at first glance are the dramatic lines used, both horizontally and vertically, through the whole of the contemporary home design. 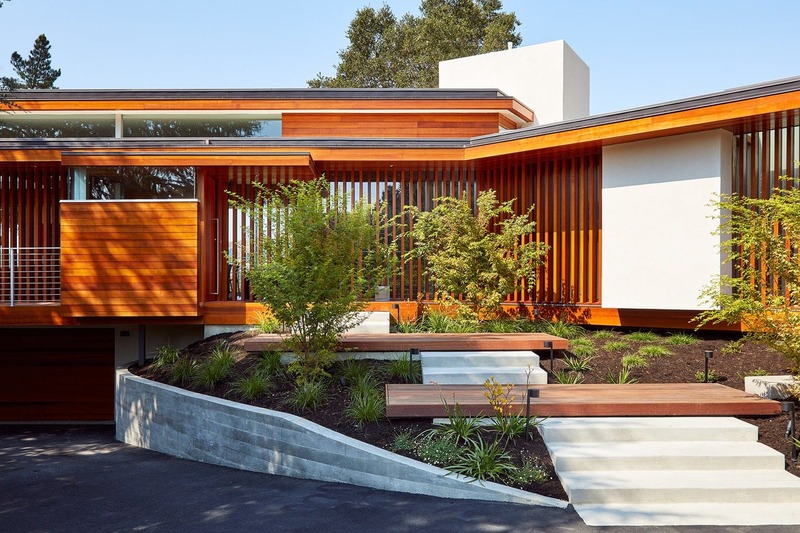 From the get-go, several layers of horizontal lines made up of the stairs and their intermediate landings leading up to the one-story home’s entrance are met with vertical wooden features along the front. 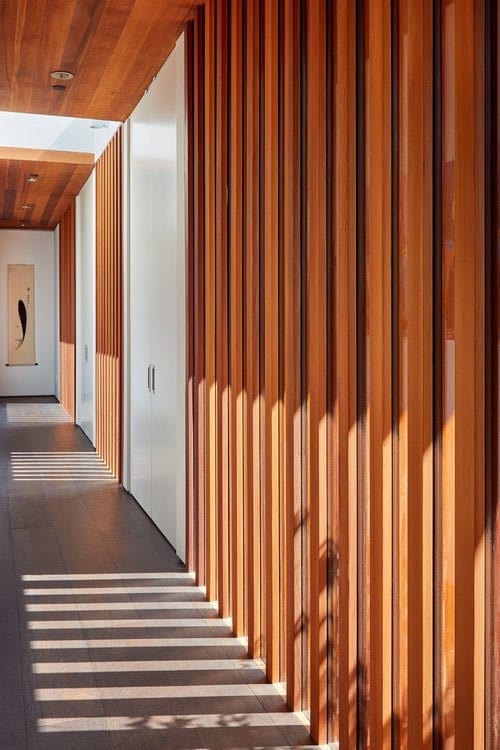 These wooden details grant natural light to slither through for a compelling play of shadows in corridors and living spaces, depending on the position of the sun. 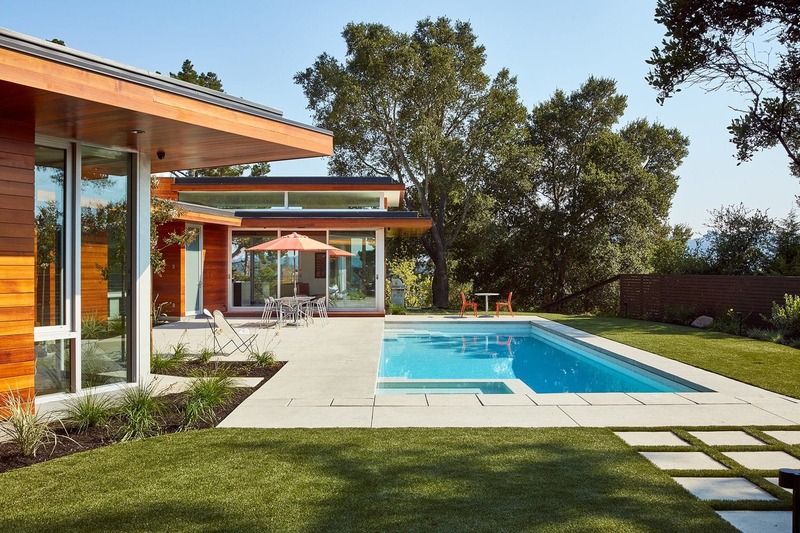 Swatt | Miers architects built the sophistically executed modern house over the footprint of a pre-existing building, using no less than ninety perfect of the foundations. 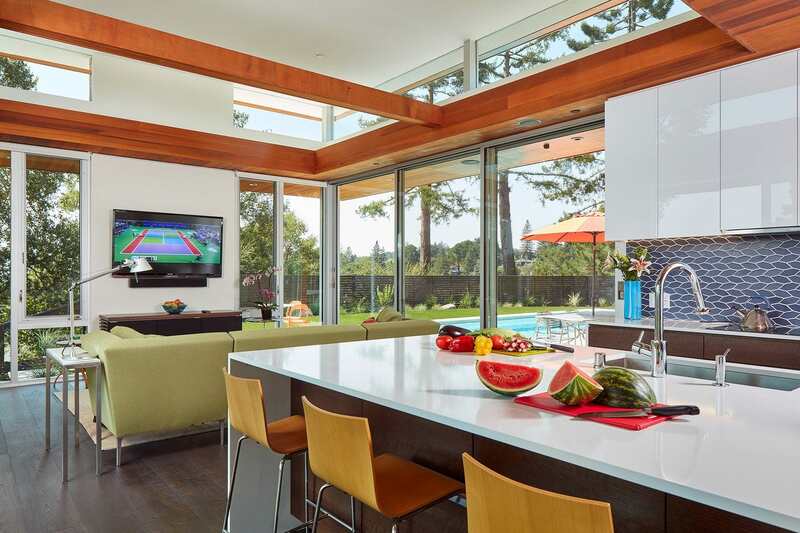 However, some major changes were in order, including a raised roof and means to allow for higher amounts of natural light infiltrate the home. Inside, a large open plan kitchen joins forces with the living and dining room areas. A wild combination of different shades of wood is used in the large space to fill various purposes; dark wood flooring, pinewood hues are used for ceiling and paneling, whereas much lighter shades wood is found in small coffee tables stand supported by dark steel legs as well as bar stools in the kitchen area. Overall, the modern style interior design is quite playful in the way the furniture and details are not all in line regarding material or color palette, yet the end result does not cross the line before running the risk of being categorized as puzzling. The master bedroom at the back of the home overlooks a pool deck which is surrounded by white tiling and grass. The leisure space leaves plenty of room for the family to enjoy the outdoors, while revealing glimpses of the sloping landscape as the area lies at the edge of the hillside. 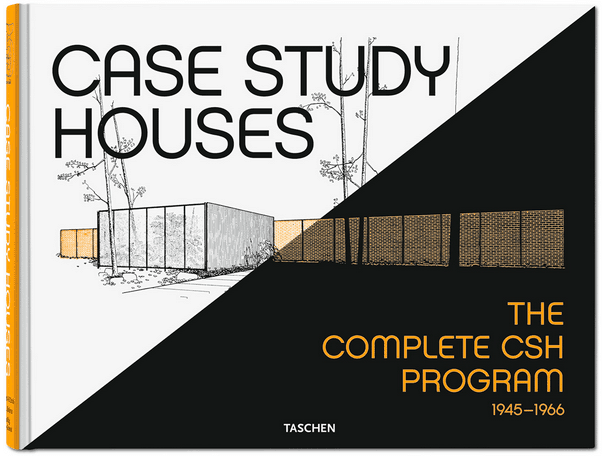 All of the major spaces make use of being able to connect to the outdoors at any given time, a trait most certainly definitive of midcentury modern architecture.